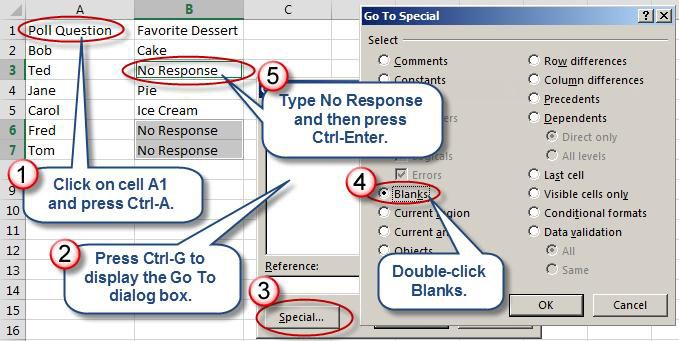 Three Ways to Fill Blank Cells within Excel Spreadsheets » Accounting Advisors, Inc. Periodically, you may have a need to fill in gaps within an Excel spreadsheet. One way to do so is to manually fill in each cell, but in this article, I'll show you three alternatives. First I'll use a formula, then Excel's Find and Replace function, and finally the often-overlooked Go To Special feature. In this case, the two double quotes determine if the cell is blank. If so, the IF statement returns the words No Response; otherwise, it returns the present contents of cell B2. Next, select cells C2 through C7 and press Ctrl-C. Right-click on cell B2 and then choose Paste Special. Double-click on Values to replace the original values. At this point, you can erase cells C2 through C7. Figure 1: You can use an IF statement to populate blank cells. As you can see, ISBLANK returns TRUE if a cell is blank, or FALSE if it isn't. Of course, in this case you don't necessarily need to use a formula. As shown in Figure 2, you can select cells B2 through B7, and then press Ctrl-H to display the Replace dialog box. Leave the Find What field blank and enter the words No Response in the Replace With field, and then click Replace All. This will automatically fill in the blank cells with the word No Response. Figure 2: Find and Replace allows you to fill in blank cells. A third way you can fill in these blank cells is to click once on cell A1, and then press Ctrl-A to select the list. Press Ctrl-G to display the Go To dialog box, and then click the Special button. Double-click on Blanks, which will result in just the blank cells being selected. Type the words No Response, and then press Ctrl-Enter. Doing so will put the words No Response in all of the selected cells at once, as shown in Figure 3. 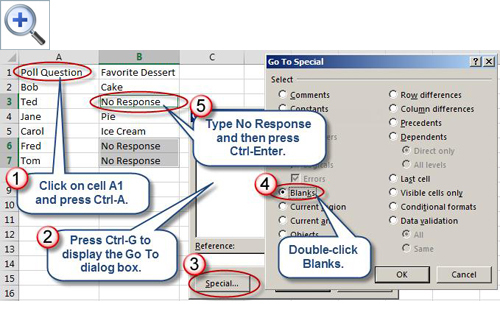 Figure 3: The Go To Special command allows you to select Blanks, while Ctrl-Enter fills multiple cells.